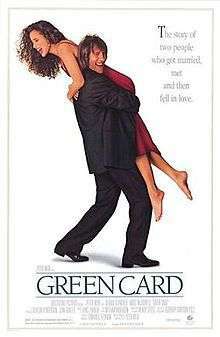 Green Card is a 1990 romantic comedy film written, produced, directed by Peter Weir and starring Gérard Depardieu and Andie MacDowell. The screenplay focuses on an American woman who enters into a marriage of convenience with a Frenchman so he can obtain a green card and remain in the United States. Depardieu won the Golden Globe Award for Best Actor. The film won the Golden Globe for Best Motion Picture – Musical or Comedy, and was nominated for an Academy Award for Best Original Screenplay. There is an Indian film with a similar plot, Nala Damayanthi (2003). A few days later, Georges invites Brontë to join him at the cafe where they first met. When she notices one of the immigration agents is seated nearby, she realizes Georges is being deported, and finally aware she loves him, tries to stop him from leaving. Georges promises to write every day asking the same question "When are you coming, Cherie? ", a line he had also used when describing their fabricated courtship to the INS. Then, Georges is deported back to France, just as they have admitted their love for each other. Peter Weir wrote the script, an original, specifically as a vehicle for Gérard Depardieu to introduce him to a wide English-speaking audience. It should also be noted that this film is almost identical in plot (and uncredited) to a Michel Brault film, Les Noces de Papier (The Paper Wedding), released in 1989. The film earned mixed reviews from critics, as it currently holds a 56% rating on Rotten Tomatoes based on 18 reviews. ↑ Broeske, Pat H. (14 January 1991). "Home Alone in 9th Week as No. 1 Film : Movies: 'Godfather Part III' takes dramatic slide from second to sixth place in its third week out. 'Awakenings' is in second". Los Angeles Times. Retrieved 1 January 2011. ↑ "Umbrella Entertainment". Retrieved 23 May 2013.